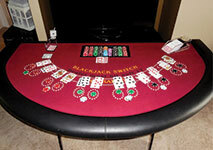 Blackjack is an enthralling card game which is played all over the world. It can be found in a number of brick and mortar casinos but not only as the game is also offered virtually. With the advancement of the new technologies and the Internet, various online casinos have emerged on the online gaming market. Thanks to them, you have the opportunity to enjoy the game along with some of its most popular versions at any place and time. Presently, there is an extremely huge diversity of variations which give you the chance to experience the game in a whole new way. Have you ever found yourself in a situation in which you wished you could exchange your cards with the player sitting next to you? If the answer is yes, you might want to consider trying perhaps one of the most innovative and interesting variations of the game – Blackjack Switch. This version offers an extraordinary gameplay and rules which make the game even more exciting and appealing. Moreover, it has the lowest house edge among all blackjack variations which is another thing that attracts a great number of players. Since Blackjack Switch is a variation of blackjack, it shouldn’t be much of a surprise that its basic rules are the same. In this game, your aim is to form a total which is higher than the dealer’s. In general, the higher your total is, the better your chances of winning are. However, if you surpass twenty one, you lose automatically and this outcome is known among blackjack players as busting. The way in which the cards in the deck are valued is also no different – the ace can be counted as either eleven or one and all of the face cards are counted as ten. Te points for the rest of the deck are written on each card. What sets this variation apart from the classic game and from the rest of the variations is the fact that you have two separate hands whose cards can be exchanged. If you make such a move while you are playing the standard game, it would be considered as unfair and you would be most likely immediately excluded from the casino. This unique variation gives you the chance to experience your favorite casino game in a completely different way thanks to the interesting rules it offers. The fact that you are able to switch the top cards of the two hands gives you the opportunity to improve them much easier. Another major difference this version has is the payout for blackjack as for this winning combination you will get paid even money, instead of the standard payout of 3/2. In this variation, you can place an insurance bet which pays out 2/1, providing that the dealer’s up card is an ace. Also, if the dealer has a total of twenty two, the result is a push, unless you have natural blackjack. Unfortunately, this rule doesn’t apply to you because if you form a hand whose total is twenty two, then you automatically go bust. It is exclusive to this version and it works entirely in favor of the casino. The dealer is enforced by the rules to hit on soft 17 and also he peeks for blackjack as this variation is a hole card game. The dealer will check for blackjack whenever his up card is an ace or a ten. Doubling down after splitting is permitted and you can perform this move on any two initial cards. Also, you are allowed to re-split up to four hands but this rule can vary depending on the casino. Most of the times, this variation is played with either six or eight decks but it is also possible to find a game that features only four packs of cards. At the beginning of the game you are required to place two initial bets whose amount is the same. Once you are ready with your wagers, you will be dealt two face-up cards for every hand which will be placed in the designated area on the table. The dealer receives one face up card and one card which is not visible to the players on the table. At this point, you have the chance to switch any of your top cards between your hands in order to form a better total. For instance, if one of your hands consists of a two and an eight and in your other hand you have an ace and a four, you can swap the eight with the four. This way you will form a strong hand whose total is nineteen (an ace and an eight). After you have made up your mind whether to switch any cards, you are required to choose one of the available moves which every blackjack game has – hitting, standing, doubling down or splitting if you have a pair. Another reason why Blackjack Switch is one of the most entertaining variations of blackjack is that it offers players the opportunity to take advantage of Super Match. It is a side bet which makes the game even more exciting and interesting. As its name hints, this bet wins when you have at least one matching pair in your hands. Should you decide to give it a try, you are required to put this wager at the beginning of the game before the dealing of the cards. The payout for this side bet varies, depending on the casino and the decks in use. For instance, some games offer an even money payout if you get one pair, providing that the game is played with six packs of cards. The payout for two pairs and three of a kind is 5/1. Last but not least, if you are lucky enough to get four of a kind, you will be paid out 40/1. It should be noted that even though the payouts look quite tempting, most side bets work in favor of the casino and they are not beneficial for players. Super Match offers you another way to win and it surely adds up a lot of excitement and suspense to the game. 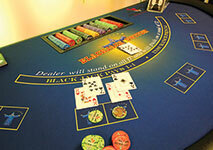 One thing which you should take your time to consider before playing Blackjack Switch is your strategy. Due to the extraordinary rules of the game which allow you to exchange cards between your hands, it won’t be possible for you to implement your plan correctly any more throughout the game. Every time you decide to switch cards, your strategy will be disrupted and as a result, it will most likely stop working properly. Therefore, it is really important to think this matter through before playing and to consider carefully what will be the best approach for this version. This way you will be able to fully enjoy yourself and make the most of every game. 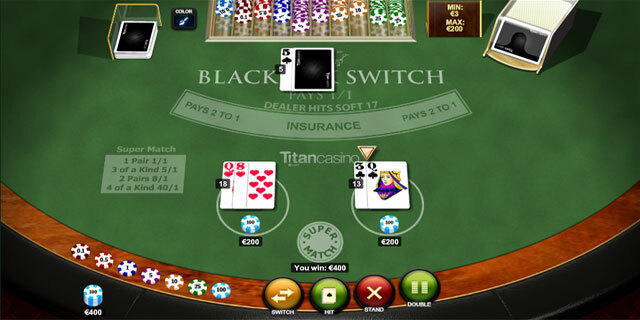 Blackjack Switch is one of the most challenging and entertaining variations which is played by hundreds of players worldwide. Its rules are very straightforward and easy to learn which makes it perfect for all types of gamblers. It is undoubtedly one of the most interesting versions due to its many extraordinary features. In this version you play with two hands and you have the opportunity to switch cards between them which significantly increase your chances of getting a winning combination. Even though it also has some additional rules which work entirely in favor of the casinos, Blackjack Switch remains the version with the lowest house edge.